From the magnificence of the royal chateau at Fontainebleau to the quiet villages dating from hundreds of years ago, the Upper Loire immerses guests into a pastoral cruise route unlike any other in France. La Nouvelle Etoile is owned and operated by the charismatic Captain Jan Meijer. Sophisticated and worldly, Jan’s lifelong passion lies in introducing barge guests to the many countries through which he cruises during the season. Jan was born into a successful Dutch shipping family; deluxe accommodations, elegant design, and glamorous style are requisites on his dapper barge. In fact, La Nouvelle Etoile boasts a long list of premium innovations, such as an elevator, exercise room, and laundry facilities. The spacious deck is the perfect place to linger a with glass of wine, admiring the idyllic scenery as the barge gently cruises through the inland waterways of Europe. When not relaxing in the hot tub, guests can explore their cruise region by walking or bicycling along the towpaths. Excursions include visits to historical highlights, local landmarks, and charming villages. Gourmands thrill to La Nouvelle Etoile’s extraordinary culinary experience, which features the Upper Loire’s seasonal ingredients and regional specialties, served at a table replete with elegant Wedgewood china, Christofle silver, and the finest crystal. Wines are selected from both local Sancerre vineyards and New World producers, reflecting La Nouvelle Etoile’s international roamings. Indeed, La Nouvelle Etoile is unique in that Jan begins the season in Holland during Tulip Time, and then floats to France via the canals of Belgium. Captain Jan spends most of the season in France, traversing many cruising regions, and then completes in the season cruising to Germany and Luxembourg on the petite Mosel River. In the afternoon, you will be met by a crew member of La Nouvelle Etoile at the designated meeting point. From here, relax as you are chauffeured to the barge, moored in the heart of the Fontainebleau Forest. After a champagne welcome, explore the medieval walled town of Moret-sur-Loing, known to many as the home of the famous Impressionist painter, Alfred Sisley. The first of many gourmet dinners is served onboard. In the morning, your Tour Guide escorts you to the Palace of Fontainebleau, the only royal chateau to have been continuously inhabited for seven centuries. Ornately decorated and opulently furnished, your guided tour provides a glimpse into European history, French culture, and ornamental architecture. An afternoon cruise is the perfect time to relax on deck with a glass of wine and admire the scenery drifting by. Chef serves tonight's gourmet dinner onboard. This morning's cruise offers time to laze in the hot tub, take a bicycle ride on the towpath, or just relax on deck. Upon mooring, your Tour Guide escorts you to the medieval town of Provins. Often referred to as “The City of Roses”, its local specialties are rose petal jam, Provinois rose honey, and rose candy. After a magnificent show featuring beautiful birds of prey, return to the barge for an evening of drinks and dinner. The adventures continue as your Tour Guide accompanies you to the town of Sens, the oldest town in France. Visit one of the first of the great Gothic Cathedrals, still a magnificent example of ancient architecture, then stroll and shop the charming pedestrian area. A peaceful cruise in the afternoon is the perfect time to relax on deck, visit your Captain in his wheelhouse, or explore the towpath by bicycle or on foot. Another gourmet dinner is enjoyed onboard. Explore France's rustic charms with a leisurely stroll or gentle pedal on the towpath as this morning's cruise glides along the River Yonne through pastoral countryside. In the afternoon, your Tour Guide chauffeurs you to the iconic vineyards of Chablis. Here, meet the viticulturists who expertly grow the pampered grapes from which this white wine is exclusively produced. Samples of the vineyard's vintages are of course offered! Upon returning to the barge, enjoy cocktails on deck as Chef prepares another gourmet dinner. Admire the passing scenery from the deck during this morning’s cruise, or explore the towpath with a brisk bicycle ride or gentle stroll. This afternoon, your Tour Guide escorts you to the city of Auxerre. 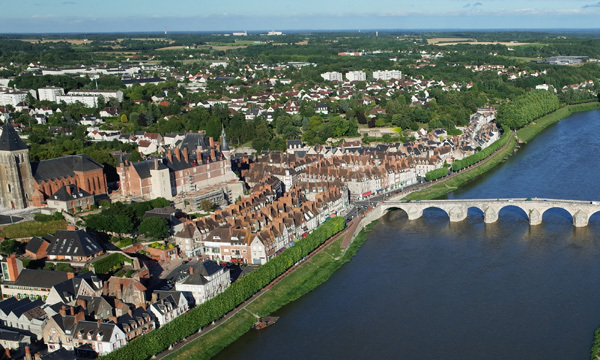 Located on the banks of the River Yonne, this historic town was first settled by the Romans, and boasts a Cathedral, an Abbey, and a Church. This is the ideal place to stroll along cobblestoned streets, browse the boutiques, or enjoy a cafe in the town square. Return to the barge for the farewell feast at the Captain's Dinner.